No historical subject is more debated today than the role of faith in the American founding. These debates often focus on the faith of the founding fathers: Jefferson, Franklin, Adams, Madison, and George Washington. The debate certainly spurred me toward writing my forthcoming religious biography of Ben Franklin. But the nature of these major founders’ personal faiths is rarely straightforward, and Washington’s own faith remains an enigma. In Ron Chernow’s extraordinary 2010 biography of Washington, we see that while Washington remained remarkably silent about his own faith, he cultivated an aura of providential favor about his own person and the founding of the American nation. Becoming the father of a new nation—in addition to surviving a war despite having a number of horses shot out from under you, your clothes riddled with bullet holes, and narrowly escaping cannonball blasts—turns one’s thoughts, it seems, to the providence of God. If Washington’s personal faith remains shadowy, his public employment of religious rhetoric was constant and heartfelt. As the war’s tide turned toward the Americans, despite all the bungling and hardships of the Continental Army, the general became more convinced that God had chosen him as the man to lead America, Moses-like, out of British captivity. 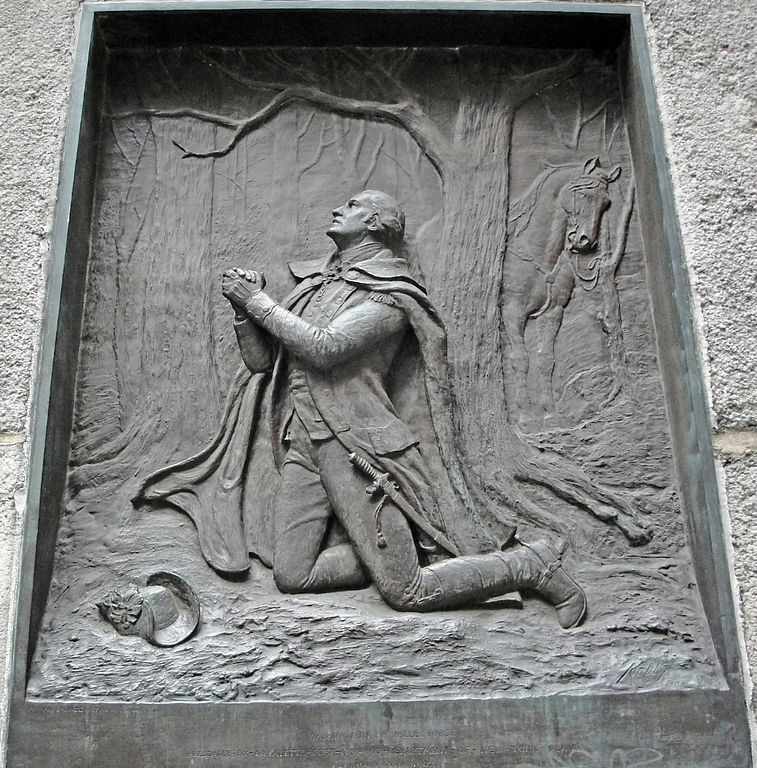 By the end of the Revolution, Washington had already begun to take on the cast of a man under a special blessing. With stunning persistence and sheer luck (or divine favor? ), Washington had led the Continental Army to victory over the fearsome British. Henry Laurens, on behalf of Congress, wrote that Americans should thank God for “the preservation of Your Excellency’s person, necessarily exposed for the salvation of America” during the war’s most awful battles. 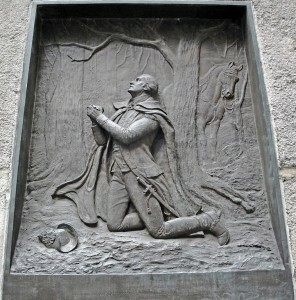 OptimumPx, A brass relief of George Washington kneeling in prayer at Federal Hall in New York City, 2010. Public Domain, Wikimedia Commons. 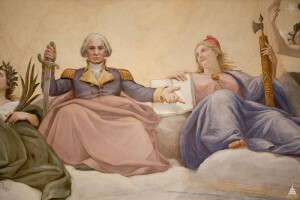 Popular prints of the “Apotheosis of Washington” showed him ascending to heaven, as does the painted ceiling of the Capitol Rotunda in Washington, D.C. Europeans noticed that Americans put up likenesses of Washington in their homes. “Just as we have images of God’s saints,” one wrote. Many Americans still exalt Washington (along with Abraham Lincoln) to an almost-sacred level, and in Chernow’s biography we learn that Washington helped to make himself a civil saint. Washington publicly marveled at the fact that he not die sometime during the Seven Years’ War or the American Revolution, and that he survived to become the president of the improbable new nation. In the mentality typical of that divinely suffused age, he could not but help see the hand of God at work in his life, and in the nation’s. Even contemporary critics thought Americans might adore their leader too much, with one asserting that “the people of America have been guilty of idolatry in making a man their God.” But surely we can admire the man without bending the knee to worship. Achieving that balance may be the greatest success of Chernow’s biography. A version of this post originally appeared at History News Network.